Tribes monitor, collect, and assess water quality annually on their lands under Section 106 of the Clean Water Act. Historically, states have submitted water quality assessments to the EPA regional offices in a paper format, creating challenges when tracking, analyzing, and sharing trend data across the EPA Regions and on a national level. 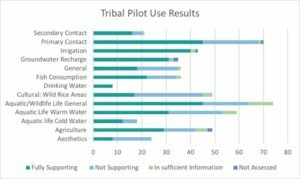 In 2016, EPA and select tribes from Regions 5, 6, and 9 initiated a pilot to electronically report water quality assessments alongside states and territories in the Assessment, Total Maximum Daily Load TMDL Tracking and Implementation System (ATTAINS). A year after initiating the pilot, ATTAINS now provides participating tribes statistics on the most common pollutants in Indian country. 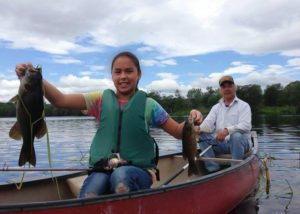 Tribes and EPA use this data to inform tribal communities of water quality issues that can impact fishing, swimming, and other activities. Upon successful completion of the pilot, ATTAINS will start to incorporate more water quality assessment information from other tribal governments that are performing water quality assessments. E-reporting will not only help inform EPA of water quality issues on tribal lands, but it will also help make tribal information more accessible in decision-making by states and territories. Through this reporting process, tribal decisions will be available alongside those made by states and territories and will show a more complete picture of water quality across the nation. For more information on ATTAINS, please contact Laura Shumway of EPA. Figure 2: Tribes identify the uses for each of their waters (e.g. primary contact = swimming, secondary contact = boating, etc.) and determine whether they can safely use those waters for their identified purpose. These are the results of the pilot tribes’ determinations.